Support for IntPtr and UIntPtr have been added to CrossTalk. 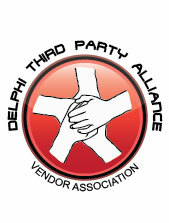 Both IntPtr and UIntPtr in Delphi are mapped as Pointer. A new release will be released later in January 2018 or early February 2018 with this support. We have also moved to Visual Studio 2017 which will require changes to our build process so we need time to schedule this work into our work schedule which is why the release will be delayed more than usual.